The information needs to be verified. Saab websites states 204 Gripens including 28 dual seat aircraft. The first JAS-39E Gripen was unveiled in Sweden on May 18th, 2016. The first flight by aircraft "39-8" was made on Thursday June 15, 2017. 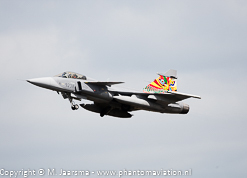 Two more JAS-39Es will be assigned to the flight test program ("39-9" and "39-10"). Will take delivery of its aircraft between 2019 - 2024. The Czech and Swedish goverments signed a lease agreement in June 2004. The lease was extended until 2027 in May 2014 with an option tp extend until 2029. The Hungarian Air Force leased 14 aircraft (12 JAS-39C and 2 JAS-39D) after an agreement between the Hungarian ans Swedish governments. The aircraft were delivered in 2006 and 2007 with all aircraft operational in 2008. In 2012 the lease agreement was extended until 2026. On May 15, 2015 JAS-39D 42 was lost. 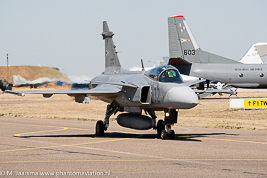 This aircraft has been replaced by Swedish Air Force JAS-39D (listed as leased in above table). 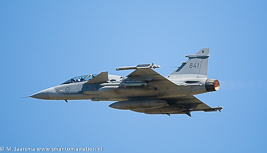 Ten Gripens will be or have been used as test aircraft. 701 Squadron 7th Wing JAS-39C/D Surat Thani Thailand 4th Air Div.